IHOP, IHOP, IHOP. I expected more from you since you’re a huge chain and all; I really did. This is a problem — a big problem. Here we have . . . (drumroll) . . . a comma splice (gasp!). It makes me sad when people try to give the job of a period (or a full stop for all my friends in the UK) or semi-colon to a comma. Commas can’t handle the pressure. They’re like nervous little poodles, shaking and wincing as the two independent clauses gang up on them. 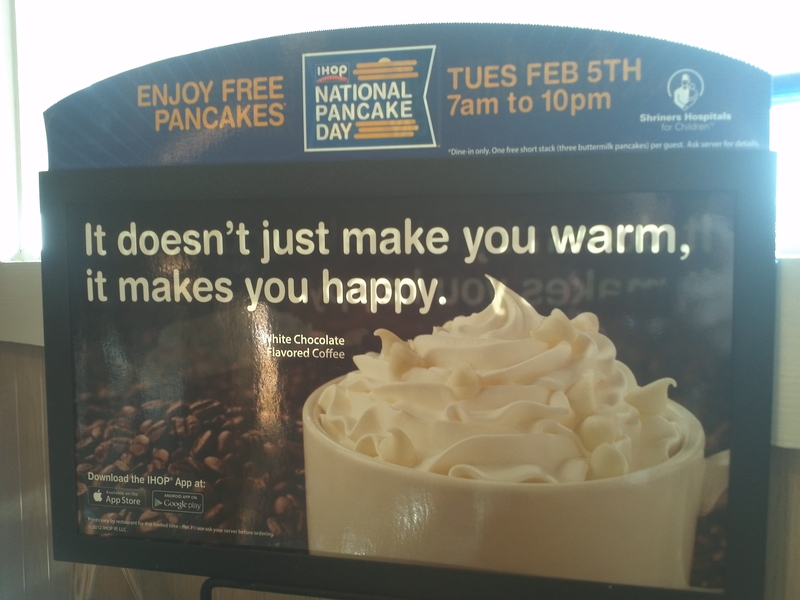 It doesn’t just make you warm; it makes you happy. It doesn’t just make you warm. It makes you happy. Please, IHOP, don’t perpetuate comma splices. Do what you have to do (bring in the reinforcements, let a period take command, whatever), but please, PLEASE, change that stinking mistake!